We recently had a vigorous debate on this blog over the academic boycott of Israel that appears to be gaining steam despite threats from politicians about retaliation. Now the boycott movement will be placed front and center in the Superbowl with a controversy over a commercial by actress Scarlett Johansson who is being paid to be the new face for SodaStream International Ltd., an Israeli company that operates a factory in the West Bank settlement of Maale Adumim. Johansson has been denounced for her work on behalf of the Israeli company and now Oxfam International is considering dropping her as an ambassador for its global work against hunger and poverty. Advocates insist that the town is actually fairly secular and supplies jobs for Jews and non-Jews. Both sides will have a chance to be heard given our past experience with controversial Superbowl ads. This is the ultimate prime time exposure for the company but the debate is not likely to be over the savings of carbonating your own drinks. Update: Fox has banned the commercial but not over the international law objections but because the commercial takes digs at Pepsi and Coke (two bigger advertisers). It is not clear if the commercial will be reworked to drop the references and resubmitted. Ironically, the company may have triggered a new boycott debate and not even make it to Superbowl audience. 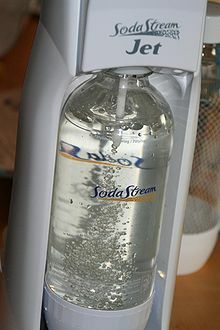 SodaStream makes machines for creating carbonated beverages at home. In the Superbowl ad, Johansson pitches for the company as a must buy for all families. Ironically, as groups like PETA have shown, controversy over Superbowl commercials is generally viewed as a good thing. You get 100 times the coverage as people show your commercial over and over. However, this might not be a case of “any publicity is good publicity.” Most people are probably unaware that the company is located in the West Bank. It also adds more publicity to the Boycott Israel movement. Ma’ale Adumim is a major point of tension in the area. It contains roughly 40,000 Israelis and was the shown of forced removal of Palestinians. In the winter of 1975, a Gush Emunim group of 23 families and six singles erected a prefabricated concrete structure and two wooden huts on the land and continued to return despite being removed by the government. In 1977, Menachem Begin’s government declared Ma’ale Adumim official status as a permanent settlement. Johansson insists that she simply accepted a promotional deal and “remain[s] a supporter of economic cooperation and social interaction between a democratic Israel and Palestine.” This is not going to be enough for critics and the controversy could well pull her and the company into an unexpected national spotlight over the boycott movement. I am glad I didn’t buy that soda stream that I was looking at. It’s not what I think…it’s what the Word of God says. Genesis 13:14-17; 15:18-21; 35:11,12; 50:24; Exodus 23:31; Joshua 15. Lots more. @randyjet: I gave a more detailed answer but it didn’t post for some reason. The short version of the covenant God made with Abram (later Abraham) is found in Genesis 15:18-21: “To your descendants I have given this land, from the river of Egypt to the great river, the River Euphrates…”. Well now we know that you think that Israel should take Jordan, Syria, and most of Iraq and Egypt to be part of Israel. Just what do you propose to do with the 80 million people living there now? It would seem that a Final Solution would have to be found. But of course, murdering all those folks would be in keeping with Old Testament traditions too. Boycott Sodastream and possibly they shut them down or they move their operations to another location within Israel or to another country and then the Arab employees will be out of a job. Now that makes a good deal of sense to me, we are going to help the Palestinians by throwing them out of a job. Well maybe you guys are on the right track, get rid of Arab employees and move Sodastream to the US and hire Americans. Good thinking. Where is that boycott website again? Note to self forget purchasing a Sodastream until it is made in the USA by Americans. It is the “progressive” thing to do. And I thought she was just another pretty face, I think I am going to go out and buy a soda stream. My purchase will help pay the salaries of the Arab employees of the company. @LibertyRising: Do you also advocate giving America back to the Indians, Texas back to Mexico, Louisiana back to France, etc? Israel has not illegally settled Palestine. Land acquired in 1948, 1967, etc., was not acquired illegally. You are on the wrong side of history and maybe you should read your Bible and see what God thinks about those who would undermine Israel. jimn I see that you are ignorant of not only our history, but of the Mideast as well You should know that the US PAID Mexico $15 million for the land acquired from the Mexican American war, and to my knowledge no other nation has paid the losing party for land acquired through war. We also paid Napoleon for Louisiana too, and my ancestors paid the Indians in MA, and CT for the land they got. Of course, you do not remember that Manhattan was bought for about $24 by the Dutch. Now if you will show us that Israel PAID the folks who owned that land, THEN you might have a point. Israel stole, took, conquered, etc. the land FAR in excess of what the UN had allocated to them in 1948 resolution on the partition of Palestine. That is in any case a moot point since Israel is not in violation of any UN ruling for that territory which makes up the pre-1967 borders. As even Israel admits, THEY struck the first blows in the 1967 war, thus THEY are the aggressors. Israel has been ordered to give back that land since it was acquired illegally and is in violation of the UN Charter. So any settlements are illegal and products from that area are legitimate targets for boycotts. By the way, just how big should Israel be according to your biblical ideas? I know that before the Brits pulled out, the Zionists wanted ALL of Jordan not just the West Bank They also wanted a good part of Syria and Lebanon too. So how big do you think Israel should claim as part of its biblical rights?